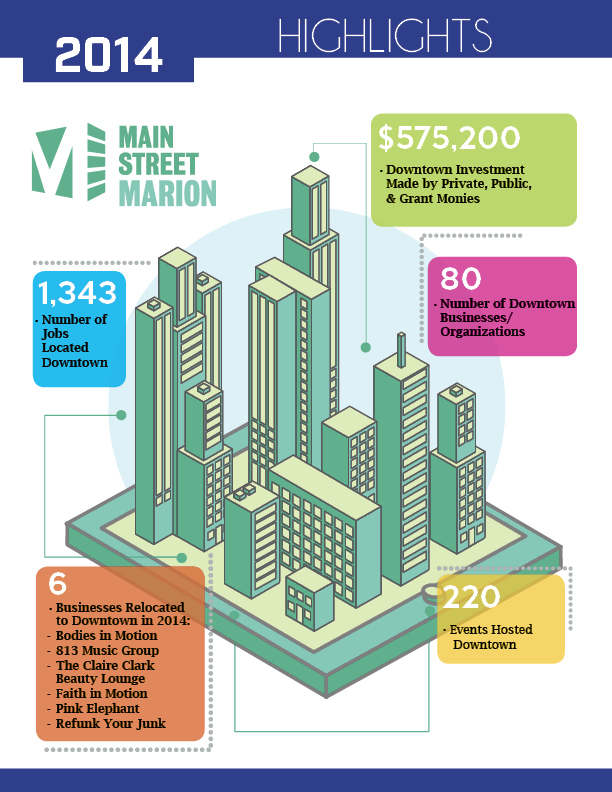 Main Street Marion is an independent 501c3 nonprofit downtown association that inspires, unifies and champions the Downtown Marion Experience. MSM is organized to promote and stimulate the downtown Marion economy. Here are a couple of downtown highlights from 2014! There were 220 events hosted downtown Marion. 6 new businesses opened or relocated downtown last year. 80 businesses operated in the downtown district. 1,343 jobs located downtown. $575,200 invested in the downtown district by private, public, and grant monies. Main Street Marion has a high-functioning board of directors. Our board members serve as council, volunteers, committee chairs, and downtown constituents. Our executive board includes Eric Marshall as President, Marc Lobdell as Vice President, and James Harris as Secretary/Treasurer. Board at-large members are Happi Stoffel, Michael Hotz, Angie Martz, Michelle Armand, and Michael Halstead. Currently serving as an auditor from the Grant County Leadership Class is Layla Adair Price. Main Street Marion’s City Liaison in 2015 is Brad Luzadder. The Main Street Marion director is Loretta Walker. Many thanks to Bridges Community Service, Main Street Marion has a small part-time staff. Our team includes Mary Harrell also known as Pucci and Celeste Scott. Moving forward, Main Street Marion has an ambitious and solid Four-Point Approach for 2015. The Design committee will beautify downtown with murals, enhance facades with great signage opportunities, and clean-up the streets by eliminating weeds sprucing up the planters. The Promotions committee will continue a full calendar year of First Friday Downtown Celebrations and weekly Thursday Picnics in the Courtyard from May to September. The Organization committee will work diligently to raise funds, gain support, and connect sponsors to new and exciting opportunities downtown. The Economic Restructuring committee also known as the downtown toolbox will develop a thorough understanding of the district’s economic condition and its best opportunities for investment. Now in existence for over 25 years, Main Street Marion continues to strive to expand its programs and offerings to the community and create a sustainable organization. We hope that you will be able to take part in one or more of the many exciting events that we are offering this year and experience firsthand the pride we take in supporting our cause, downtown Marion. In order to meet our mission and provide services in our community, we rely on the generosity of individuals and businesses for support. Without the assistance of community-minded individuals just like you, we wouldn’t be able to serve our mission each year. We ask that you make a commitment to support our annual appeal by making a donation. This year our annual supporter goal is $20,000, and we hope that you will be able to make a contribution. Your generosity will make a difference in our community by allowing us to continue in our work. Previous MAIN STREET MARION CALLS FOR MUSICIANS, ARTISTS, VENDORS, & VENUES! Next March First Friday is March Madness!